shhhh.... >> Radio Booking Secrets Training - Radio Guest List.com - How to Get Radio Interviews and Find Podcast Guests! Have you noticed that anyone who figures out how to promote their books and products “on the air” for free usually keeps the info to themselves! But getting more publicity and then more website traffic and sales is your goal, isn’t it? To help solve this problem check out the “How to Get Radio Interviews” MP3s Training Series TODAY at http://www.howtogetradiointerviews.com. This is truly “insider information” from my years of successful radio and podcast interviews, both as a best-selling author promoting my books and as a podcaster and radio host myself. Plus it includes exclusive tips from my years of experience as the Founder of RadioGuestList.com (the #1 radio and podcast interview booking service online), and working personally with top broadcasting stars like Larry King and Bill O’Reilly. If you’d like your own copy of the best package of “insider radio publicity secrets” training recordings available anywhere, click here to learn more here now. 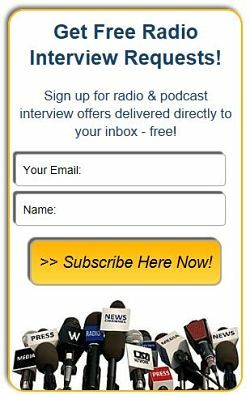 Click to learn more about how we can help you get that radio interview publicity you deserve!